One of the most compelling arguments for the adoption of a zero waste program is the transformation of waste into a commodity. Rather than simply recycling cardboard, plastic wrap, paper or aluminum, many organizations are selling them on the back end of their operations. This generates income for the facility. When it comes to turning waste into revenue, source separation is paramount. Once an organization understands the value in its waste products, it becomes hard to look at recycling the same way again. Like all commodities, some items in a facility’s recycling and waste bins will be worth more than others. According to Ashkin, white paper has one of the highest values. “If it hasn’t been contaminated with cardboard, food or newspaper, then white paper can be made into just about anything,” he says. In addition, aluminum, steel cans and plastic film that is used to wrap pallets are highly valuable. In fact, those pallets are valuable, too. “If your department gets a skid of cleaning products dropped on the dock, that plastic wrap is very prized in the recycling world, especially if not contaminated,” says Ashkin. 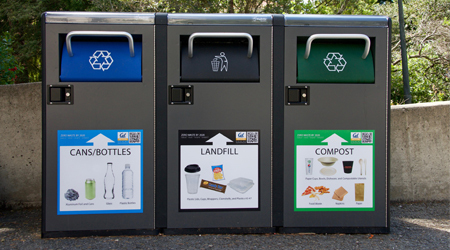 Organizations that sell their waste materials are re-investing that money into their facilities. Many are using it to enhance zero waste programs or directly investing it in team members. But no matter where the money goes, it benefits the bottom line. One TRUE platinum-certified organization, Earth Friendly Products, uses the money it makes by selling recycling products to purchase a juicer for every single one of its employees. Even things as simple as collecting bottles and cans can provide an opportunity to reward staff members. In California, these items have a redemption value. The TRUE-certified organization Ricoh Electronics rewards engagement by gifting proceeds from zero waste initiatives directly into the 401K accounts of employees who come up with ideas that help further the zero waste mission. Re-investment initiatives don’t have to be complicated. The university’s current aversion rate is 3.4 percent. The process begins in purchasing and contract decisions. For example, ASU has a partnership with Canon for all of its printers and copiers. Canon assesses the use of its equipment on campus and sets every copier and printer to default to black-and-white and double-sided settings, minimizing both ink and paper usage. “Canon can make those massive changes for us and change people’s habits just by reconfiguring its equipment,” says Levine.